Collapsible buttstock similar to the current US GI M4 carbine stock provides convenient six-position length-of-pull adjustment to fit different-size shooters, including those wearing body armor. 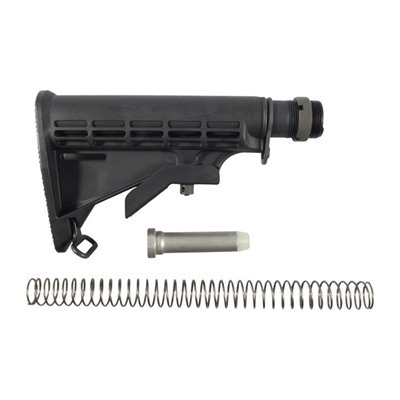 Ready to install on any standard AR-15 rifle or carbine lower receiver; includes buffer tube, receiver lock plate, lock nut, toe-mounted steel sling loop, carbine recoil spring and buffer. 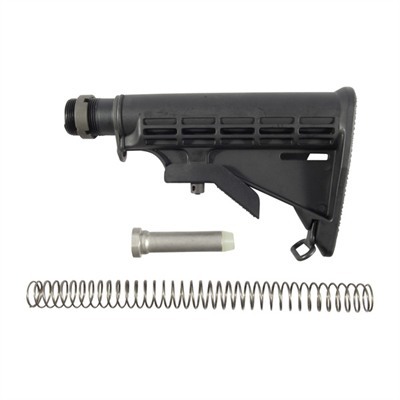 Buttstock is made from extremely tough, fiberglass-reinforced, injection-molded nylon to resist impact, heat, moisture, extreme cold, and most cleaning solvents. Steel lock nut has four square notches and pre-cut detents for staking to lock plate. Available with Mil-Spec (nominal 1.14" O.D.) receiver extension tube. Stock interior diameter is matched to buffer tube O.D. for a snug fit that eliminates un wanted play and rattles.